I installed Haiku on an old laptop, which have a SiS 900 network card (recognized as SiS900 PCI Fast Ethernet); well: DHCP never worked for me: whenever I start Haiku, in the network preflet i just see "configuring..." for ever; I tried to quit net_server (which is automatically restarted by launch_daemon) I tried ifconfig /dev/net/sis900/0 down and then up, but nothing help. To have a connection I have to go with static addresses, but is not always possible, eg when I wish to connect on another router (eg when I go in another places). I attach syslogs, output of listdev and ifconfig and screenshots: here we'll see that the net card results connected (and there is activity in sent), and that the settings network folder is not populated. syslog​ (158.0 KB) - added by Giova84 16 months ago. previous_syslog​ (98.2 KB) - added by Giova84 16 months ago. ifconfig_output.txt​ (643 bytes) - added by Giova84 16 months ago. listdev_output.txt​ (1.9 KB) - added by Giova84 16 months ago. net_screenshot.png​ (164.1 KB) - added by Giova84 16 months ago. al_xv-screenshot1.png​ (60.6 KB) - added by al_xv 14 months ago. al_xv-listdev.txt​ (2.2 KB) - added by al_xv 14 months ago. al_xv-syslog.txt​ (506.2 KB) - added by al_xv 14 months ago. al_xv-Network-434-debug-01-03-2018-22-09-13.report​ (10.2 KB) - added by al_xv 14 months ago. Network - report file generated first time Network crashed on me. I noticed that if I do these steps, most of the time wrong IP addresses are assigned to the ethernet card, or if are correctly assigned, i cannot even ping my router. Well, seems that I found a temporary solution (is a dirty workaround),thanks to the suggestions of Bruno. I see that, then, are assigned correct IP addresses from my router; as "bonus" I also change the DNS addresses and I sync the clock. When I connect my ethernet card to another router (which gives differents IP addresses and class), the file /boot/system/settings/network/interface doesn't update IP adresses. I changed the script: kill net_server > edit auto_config true to auto_config false (by using sed) > ifconfig /dev/net/sis900/0 down > ifconfig /dev/net/sis900/0 up and switch back auto_config false to true: in this way I get addresses from another router and the interfaces config file mantains auto_config true instead of old IP addresses. I have what appears to be the same issue. Just installed HREV51808 and on first boot I noticed the network TX/RX ActivityMonitor graph (see screenshot) going crazy. I tried to open up the Network prefs and received a crash (report attached). I tried opening it again and it didn't crash. I tried to change settings, but the ActivityMonitor graph was still showing lots of activity. Additionally I have my ethernet switch infront of me and can see lots of activity on my network from this machine. I rebooted to see if it was a fluke and the activity continued as before. I then unplugged the ethernet cable and noticed the ActivityMonitor graph still showing activity. ...As I went to close Network, it locked up, so I decided to reboot. On the following startup, my network activity graph showed no constant activity and I found my static configuration settings were saved. From here I re-connected my ethernet and didn't have any problems connecting to external servers. Now I'm using it to report this bug. I don't think this bug is related as your NIC is different. So I would suggest you to open a new ticket and another one for Network preflet crash as it'a also unrelated. It looks like one of two cores is busy with something, unfortunately you didn't attach ProcessController screenshot so we don't know what it is. I can only guess that it's either net_server using one core to send DHCP requests or syslog_daemon writing them to syslog (but that is unlikely giving small amount of repeated lines). Another possibility is that ipro100 doesn't handle interrupts correctly. To check this you can drop to KDL with kernel_debuggger command and typing ints there followed by co to exit KDL. A few seconds later KDL output should appear in syslog. Finally, you can blacklist your ipro100 driver and see if that fixes CPU activity. As far as I know, this is just a single core Pentium 4, but the CPU usage was not my issue. I was reporting the issue of DHCP settings resulting in packets being broadcast endlessly from the NIC every second. 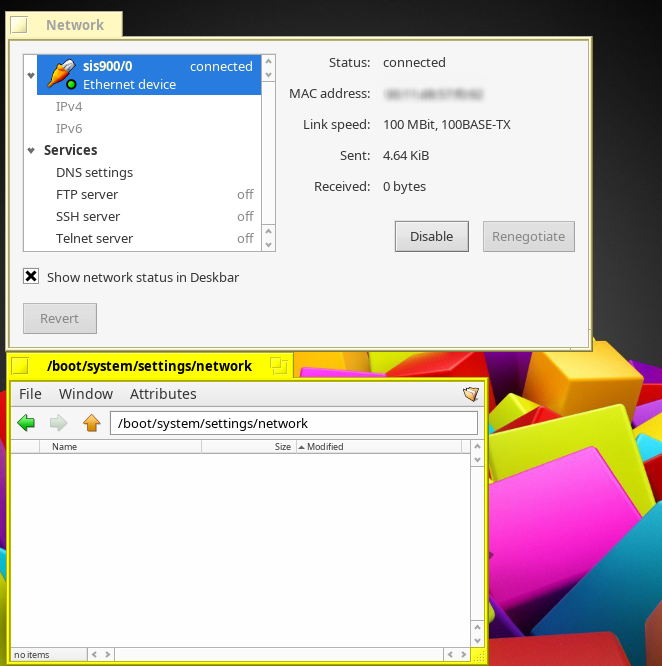 The attached screencapture was to show the network behavior, not CPU. unfortunately you didn't attach ProcessController screenshot so we don't know what it is. I can only guess that it's either net_server using one core to send DHCP requests or syslog_daemon writing them to syslog (but that is unlikely giving small amount of repeated lines). It seemed like a significant amount of lines in the syslog. The network activity and syslog entries were non-stop until I made an effort to stop it by changing to a static IP. Please let me know what you would need for a screenshot of ProcessController. I'm going to try to reproduce this so I can try to get a screenshot for the new ticket I will open. Just let me know what you need to see. I will try this when I try to reproduce and report results. Won't this disable my NIC? Ah, yeah. it was using 50% CPU and not a separate core. WRT ProcessController, just open it and find what team/thread is using CPU the most then take a screenshot. Yes, blacklisting will disable your NIC. Just a though, maybe you can extract ipro100 driver from R1A4 and see if it still works? Please retest with a recent nightly; the SiS 900 driver was completely replaced. No reply; and remaining issues likely fixed after hrev53000. Closing.